On December 14, 2018 the Great Calligraphy and Painting exhibition was officially presented, and thus the countdown has begun! With the project started six months before, the presentation was about drawing some intermediary results. 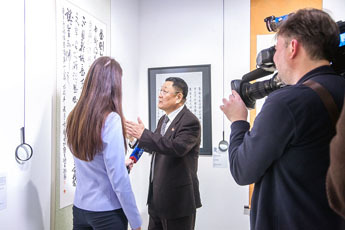 Director of the Contemporary Museum of Calligraphy Alexey Shaburov shared the successes so far reached within the project. 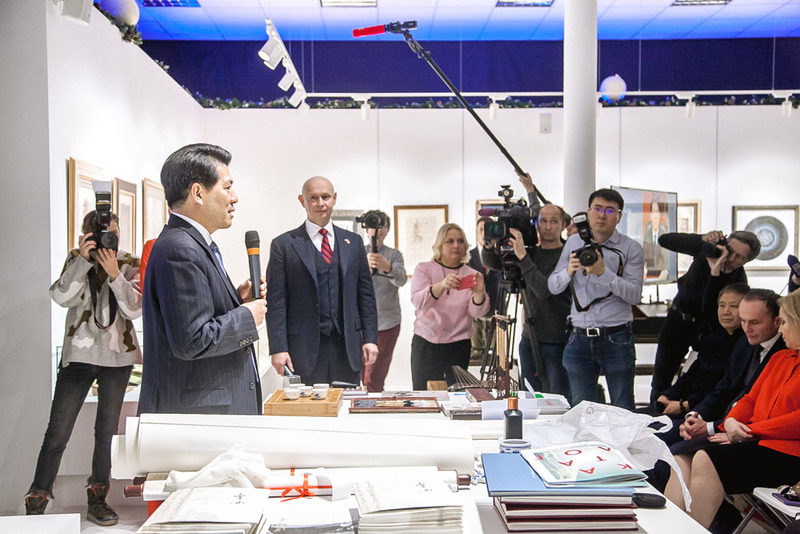 In the coming year Russia and China celebrate the 70th anniversary of diplomatic relations that have been established October 2, 1949 between the USSR and the newly established People’s Republic of China. 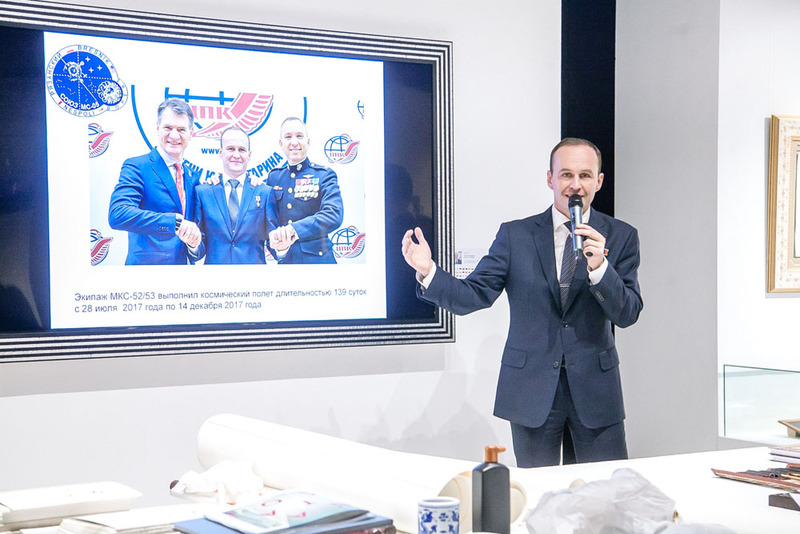 The coming exhibition is dedicated to this important date and is featured in the list of official events to be held in celebration of the anniversary. The exhibition is due to be held September 20-22, 2019. Official exhibition opening ceremony is on September 20 at 3:00 PM. The venue has been kept secret so far. The presentation was attended by the project organizers and partners. The organizers of the exhibition are: The Contemporary Museum of Calligraphy, and the Sharp-pointed Nib All-China Calligraphy Association. The Association counts with almost 50 thousand members. It has representatives throughout continental China, and also covers Macau, Hong Kong, and Taiwan. Event host Galina Shimanskaya officially presented Mr. Zhang Huaqing, Chairman of the Association and Vice-Rector of the Kamin Academy within the Association for the Promotion of Democracy who was present at the event. 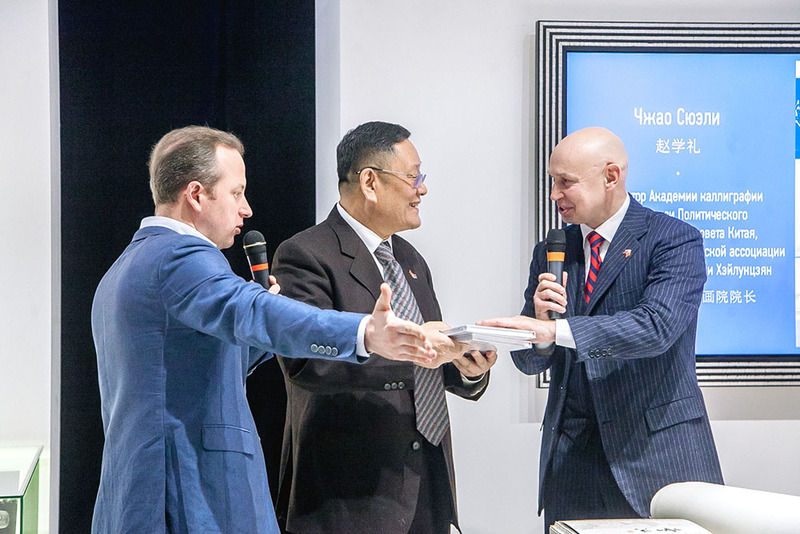 Partners of the exhibition are: Sokolniki Exhibition and Convention Center, the All-China Association of Calligraphers of Heilongjiang Province, the Worldwide of St. Petersburgers Club, the National Union of Calligraphers. Vice-president of the All-China Association of Calligraphers of Heilongjiang Province, Director of the Academy of Calligraphy and Painting of the Political Advisory Council of China Zhao Xueli was represented among the delegates from Heilongjiang Province. The official part included words of gratitude addressed to the representatives of ministries and departments that helped realize the project and provided timely support at various stages of its implementation. The project came to life thanks to the support of the Ministry of Culture of the Russian Federation, the Ministry of Foreign Affairs of the Russian Federation, the State Duma Committee on Science and Education, the State Duma Committee on Culture, the Embassy of the People’s Republic of China, the China-Russia Friendship Committee for Peace and Development, the Society of Chinese-Russian Friendship, the Council of the Federation Committee for Foreign Affairs, the China Cultural Center in Moscow., the Worldwide St. Petersburgers Club. 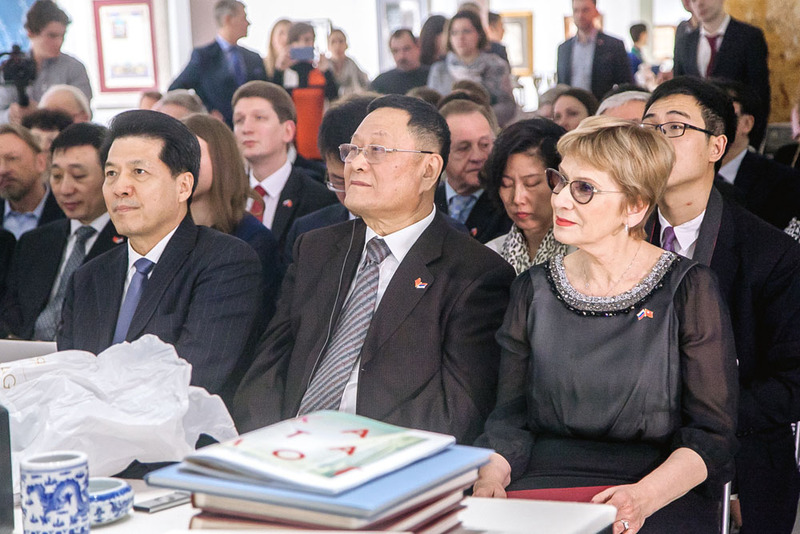 Among the event’s guests of honor who offered their welcome addresses were Lyubov Dukhanina (State Duma Deputy, Deputy Chairman of the Committee on Education and Science), Mr. Li Hui (Ambassador Extraordinary and Plenipotentiary of the People's Republic of China in the Russian Federation), Mr. Zhang Huaqing (Chairman of the Sharp-pointed Nib All-China Calligraphy Association), Mr. Zhao Xueli (Vice-President of the All-China Association of Calligraphers of Heilongjiang Province), Boris Titov (Chairman of the Russian Part of China-Russia Friendship Committee for Peace and Development), Valentina Orlova (Chairman of the Board of the Worldwide St. Petersburgers Club). Among those invited there also were: Irena Gavva, First Secretary of the First Asia Department of the Russian Foreign Ministry; Vitaly Monkevich, President of the Russian-Asian Union of Industrialists and Entrepreneurs; Alexander Sedov, General Director of the State Museum of Oriental Art; Ms. Wang Rui, 2nd Secretary of the Embassy of the People’s Republic of China in the Russian Federation; Andrey Busygin, former Deputy Minister of Culture of the Russian Federation (2008-2013); Evgeny Kolesov, author and presenter of the Discovering China TV program on Channel One, founder of the OPTIM consult company; Alexey Aleksakhin, head of the Department of Chinese, Vietnamese, Laotian and Thai Languages; Elena Voitishek, Head of the Moscow State University Department of Oriental Studies; Ivan Arkhipov, Director General of the Arkhipov Foundation for Economic Cooperation; as well as the heads of such media as the Museum World magazine, the China News magazine, head of the China magazine office in Moscow; and other prominent figures. 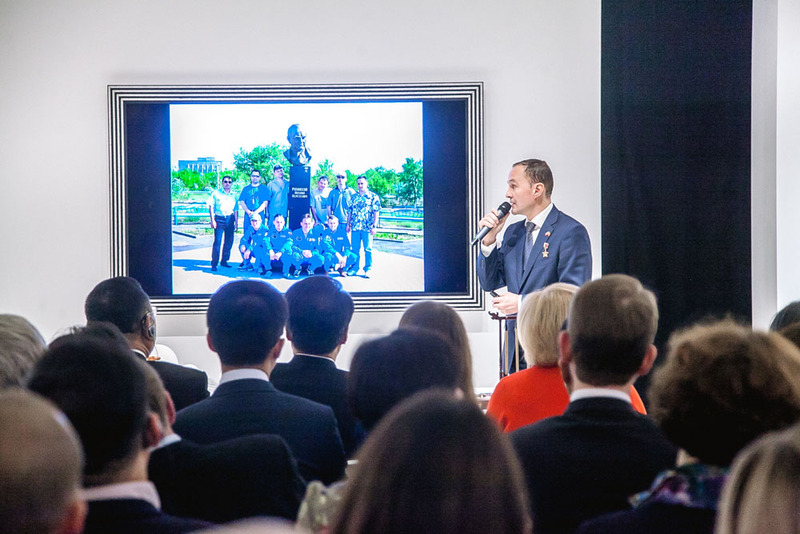 A speech from Sergei Ryazansky, the Russian test cosmonaut of the Roscosmos cosmonaut detachment, the world's first scientist-commander of a spacecraft, came as a real surprise for both the guests and the media. He spoke about the connection between humanity and the space, about the mysteries of the universe, about calligraphy in the space, and shared some of the most vivid scenes from real life inside a spacecraft. Like space travel, the Great Calligraphy and Painting exhibition will be an unforgettable travel around the calligraphic China. The exhibition will feature over 300 calligraphy and traditional art works from all around China placed within an area of 3.5 thousand square meters. There will be thematic sections for music, poetry and tea ceremonies within the exhibition. After all, it is impossible to take only calligraphy and painting, separating them from these other magnificent elements of culture which, one way or another, permeate each other. UNESCO has added the art of brush calligraphy to its List of Intangible Cultural Heritage. There will be a special section dedicated to calligraphy works by the calligraphy contest winners. “We already have our experts, and they will be quite strict in making their appraisals. 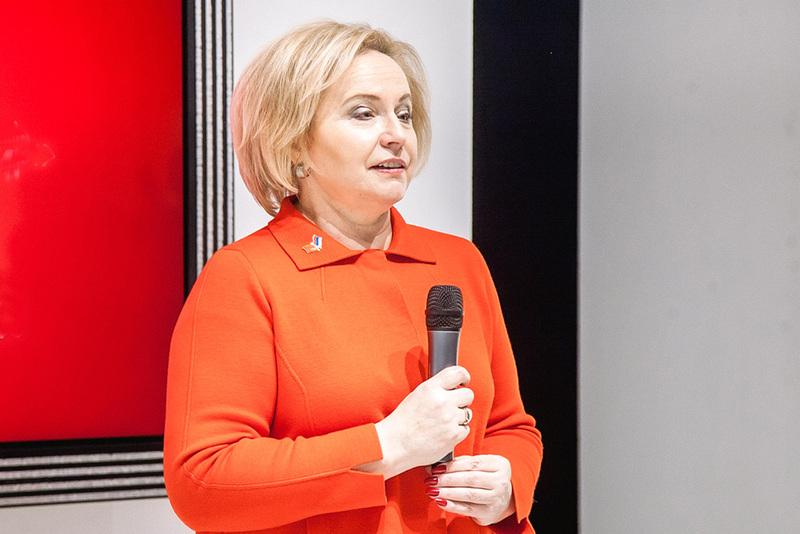 We’d rather have fewer winners, but those who are really the best within Russia,” museum director told the reporters. 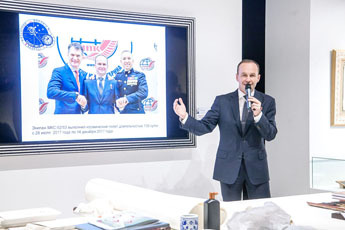 A draft of the 2019 exhibition catalogue was demonstrated at the presentation. It already contains entries on more than 20 authors. It’s worth noting that calligraphy and painting have one thing in common: the absence of an object which, unlike with abstract art, is governed by a system of rules (法 (fa) means law or rule), and by the presence of the form and a certain meaning (意 (i) stands for idea or meaning). Most of the authors writing about Chinese or Japanese art emphasize the musicality common to both calligraphy and painting. There will also be Russian residents featured in the catalogue. Some of their works can already be found on its pages. For example, there are works by Anna Donchenko, winner of the calligraphy contest of the World of China inter-university linguistic-cultural conference, an employee of the Institute of the Far East of the Russian Academy of Sciences. 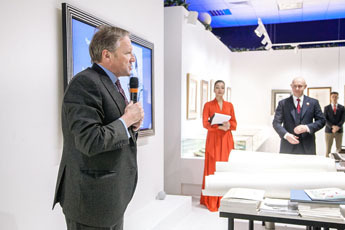 Pieces by Alexander Goldstein, another artist practicing Chinese calligraphy, were praised high by the experts. 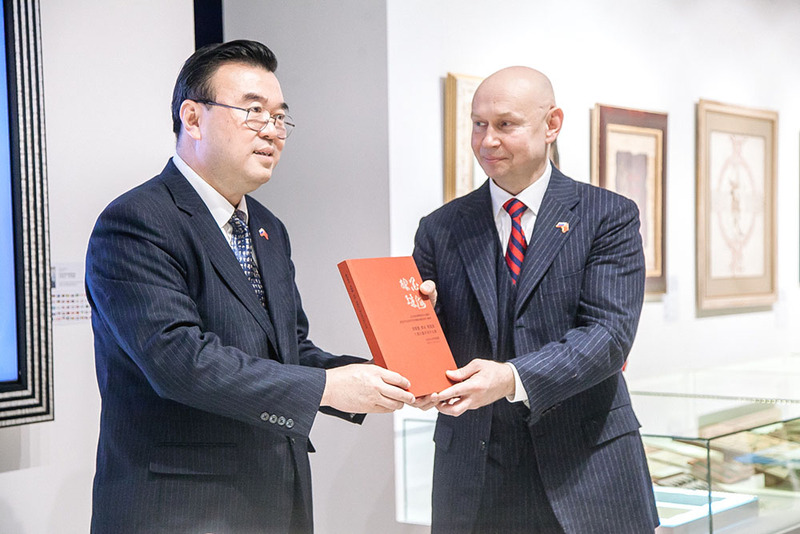 The presentation ceremony also featured the publication of the expert opinion issued by the Museum of Oriental Art. 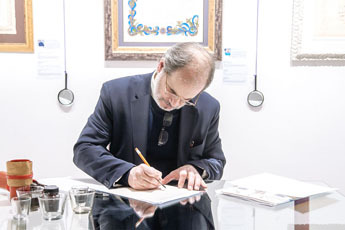 The document says that “the works from Alexey Shaburov’s collection created by contemporary artists and designers are original and unique art pieces of a significant artistic and cultural value, and are worth including in the non-sate collection of the Museum Fund of the Russian Federation.” This is a very important development raising the status of the museum and the calligraphers exhibiting there to a new higher level. Two of the authors whose names are already featured in the list were present at in the audience: Zhao Seyueli and Luo Lei. 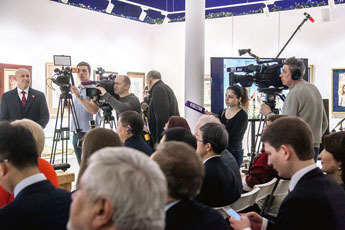 Museum director thanked the experts who had provided invaluable advisory support in conducting the art expertise: Anna Kovalets, Deputy Director of the Museum of the History of Oriental Peoples, Irina Petrova, Data Flow Manager at the Department of Centralized Recording of the Museum Fund, and Daria Markova, Head of the Department of the Museum Fund of the Russian Federation. An album of New Year cards deserves special attention. The album dubbed Greeting Card calligraphy: New Year cards from 1949 to 1962, consists of unique original pieces found thanks to one of the museum’s colleagues. 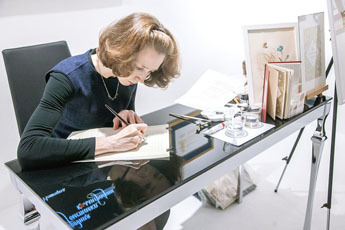 One of the Calligraphy Museum activities lies in searching for unique private museums throughout the Russian Federation. There’s a set of Chinese cards with New Year greetings given to Soviet political workers. One of the cards dating back to 1957 has the signature of Zhou Enlai, he first Premier of the State Council of the People's Republic of China. Being a second person in the state, he was nonetheless forever shadowed by the Great Helmsman Mao Zedong. Apart from these cards, Vladislav Dmitriyev had also provided cards with unique pre-revolutionary, revolutionary, wartime, and later 20th century inscriptions. His is a truly unique collection. Director of the Contemporary Museum of Calligraphy Alexey Shaburov solemnly presented the Chinese Ambassador Li Hui with an album of exact artistic copies of the postcards. The gift was praised high by the receiving party. The atmosphere was filled with inspiration. Representatives of the Chinese calligraphy association were so inspired by the project that decided to create several New Year greeting cards right after the presentation. Culture, however, is culture, and business is business. As the project develops, new partners arrive and take upon themselves the implementation of various lines of business activities. 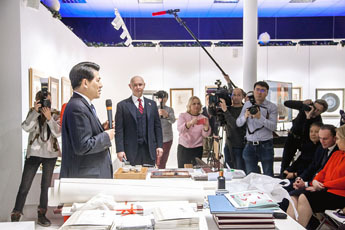 Thus, the Museum’s work brought us a tea exhibition (to be held November 28th through December 1st, 2019): one of the examples of a successful synergy of business, history and culture. There were also present some of the project’s partners from China who had helped in arranging negotiations in the industrial and agro-industrial sectors regarding the development of eco manufacturing in China. Everyone knows about the Great Silk Road, and in her book Tsybyk of Tea Stories Victoria Sharonova speaks about the Great Tea Road. The recent intergovernmental project One Belt, One Road provides for a restoration of the lost economic ties and the creation of new variants of cooperation within this road. 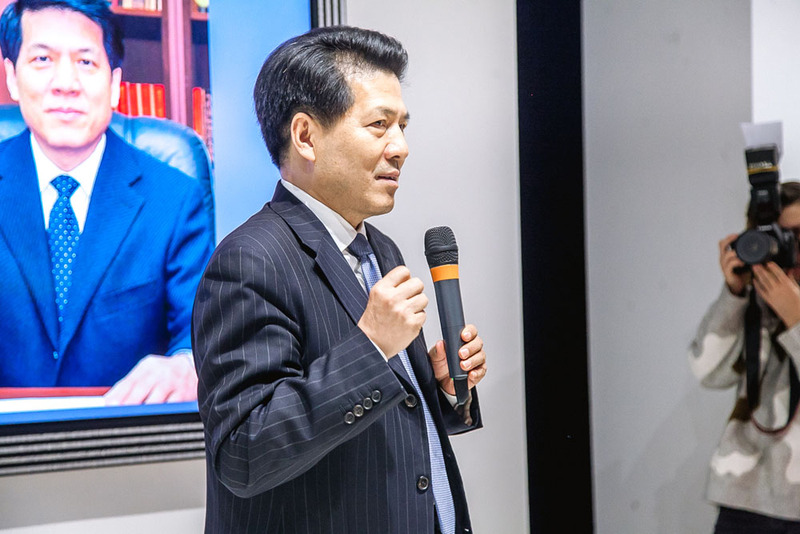 Mr. Mu Pin, Head of the Shans International Publishing House, prepared a video address for those gathered. He mentioned that the publishing house has two projects with the museum for 2019. Those are two catalogues listing Russian and Chinese private museums. An interesting scientific research is being undertaken on the two phenomena: how and why private museums appear in each of the countries, and what are their similarities and differences. “We hope to have the Russian private museum catalogue published by the end of this year or early next year, and by spring it will be translated into Chinese with the aim of widening the touristic attractions of the Russian Federation,” said Alexey Shaburov. 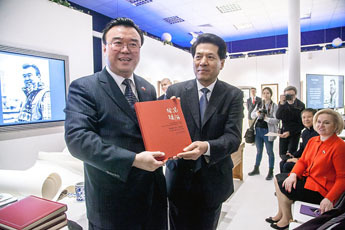 The official part of the event was followed by a cultural program: calligraphers from China’s two leading calligraphy associations (Sharp-Pointed Nibs and the All-China Association of Calligraphers of Heilongjiang Province) held workshops accompanied by music played on the guquin, a traditional Chinese instrument. Everyone present witnessed works of art being born one after another. Russian calligraphers Yuri Koverdyayev and Svetlana Molodchenko worked under the accompaniment of gusli played by the great Dmitry Paramonov. Guests of the event could also enjoy the rare 19-century Scribe’s Study exposition from the collection of Sergey Nelyubov, a Russian Ministry of Culture expert and owner of the Votchina ethnography museum. 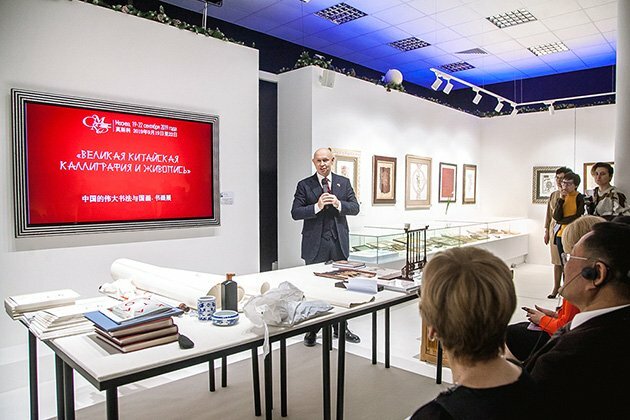 Moreover, for one day only, the museum showcased Russia’s largest and unique collection of metallic nibs belonging to Vadim Wolfson.